The film tells the story of its titular heroine’s epic voyage across the ocean. Accompanied by the demigod Maui, voiced by Dwayne Johnson, Moana embarks on a quest to restore life to her home of Motonui, threatened by the lava goddess Te Kā. 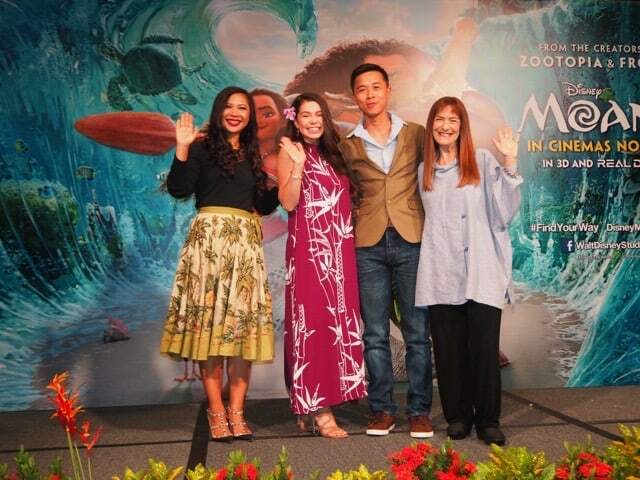 In addition to Moana’s voice actress Auli’i Cravalho, producer Osnat Shurer, lighting artist Roger Lee and visual development artist Griselda Sastrawinata took the stage to talk to the press about the film. Before the press conference began, we were treated to a performance of the song How Far I’ll Go from the film. Janella Salvador from the Philippines, Maudy Ayunda from Indonesia, Ayda Jebat from Malaysia, Myra Maneepat Molloy from Thailand and Minh Nhu from Vietnam performed the film in their respective native languages. Molloy and Minh Nhu are voicing Moana in the Thai and Vietnamese dubs of the film respectively. Cravalho did seem like a Disney princess come to life, displaying both bubbly enthusiasm and measured poise throughout the press conference. “We’re practically all family from across the sea,” she said cheerily to the crowd. Clements, Musker and Shurer auditioned hundreds of Polynesian women for the lead role, and Cravalho was the last one they saw. “I didn’t initially audition for Moana, because [at] first, I had seen so many wonderful auditions on YouTube, and my friends were trying out, and I thought ‘you know what, whoever is chosen is going to be so awesome’,” Cravalho admitted. The character’s name means ‘ocean’, and Cravalho’s hobbies include paddle-boarding and sailing. “It’s meant to be, I now believe in fate,” Cravalho said. She added that she doesn’t do any land sports, because she’s “a klutz on land”. Cravalho took the responsibility of representing her Polynesian heritage seriously. “This movie is real,” she proclaimed. “Wayfinding and navigating by the stars, that’s something that my ancestors really did, so the fact that Disney has made a film that is inspired by my culture, gives me a great deal of pride.” Moana is an adventurer, descended from a long line of voyagers who settled down and stopped traversing the ocean a thousand years ago. “Another thing that I love about Moana is that I get to describe her as a heroine,” Cravalho enthused. Great pains were taken to ensure that the rich culture of Oceania was not shown in a superficial manner, with Clements and Musker leading multiple research expeditions to the Pacific Islands. Disney assembled a team of advisors who came to be known as the Oceanic Story Trust, comprising anthropologists, archaeologists, educators, linguists, master tattooists, dance choreographers, haka practitioners, navigators and experts on Polynesian culture. Cravalho’s choice of favourite Disney character made perfect sense – it was a heroine who, like Moana, embarked on a life-changing, self-sacrificial adventure: Mulan. “She’s so incredibly amazing and she broke that gender norm, she went out there and did her thang. I remember telling myself at a young age, ‘that’s what I want to do.’ I want to honour my family wherever I go,” Cravalho declared. At the conclusion of the press conference, Cravalho, Shurer, Lee and Sastrawinata were presented with bento boxes designed by Shirley Wong. Made with local ingredients, the food was arranged to resemble characters from Moana. “This is the most beautiful food I’ve ever seen,” Cravalho exclaimed. Moana opens on 24 November 2016 in Singapore. Cravalho, Shurer, Lee and Sastrawinata will attend a festive light-up ceremony at the Helix Bridge at Marina Bay Sands tomorrow night, 9th November 2016, at 8 pm.